There is street parking outside our private practice facility in Downtown San Diego. Please bring change since most of the spaces in the area are metered parking until 6:00 pm. You’ll get an email the week before orientation with the exact address. How do I get in? The door is locked. We are located at 1402 F Street in the East Village area of downtown San Diego. In order to keep our facility secure, the front door remains locked at all times. You will see an intercom with a doorbell on the right side of the entryway. Please ring this once and wait patiently for someone to come to the intercom upstairs and buzz you up. You’ll pull the door toward you adn then head upstairs to the Dollhouse on the second floor. My (fill in the blank) is giving me a ride - can they come in with me and wait inside? Can I bring my other kid(s)? If you bring your significant other or children not enrolling in the program, they will need a signed Facility Waiver. Young children must be supervised at all times. My friend is interested in coming to orientation at the last minute! Can they come? Yes! Absolutely. Have them email juniors@sandiegoderbydolls.com AND fill out the form on the orientation page so we have a way to contact them. If they are unable to fill out their forms in advance, there will be extras on hand at the Dollhouse and can be taken care of on the day of the orientation. Original or a photocopy of the junior skater’s birth certificate or passport (for age verification and identification) and health or accident insurance coverage. A copy in black and white is perfectly acceptable, and a copier is available if needed. If you don’t have any form of medical or accident coverage, we will have cost effective options available for you at orientation. Read more about what to expect at orientation. Should I bring my skates/gear? How do I know what to get? You don’t need to bring your skates or gear to orientation unless you would like a knowledgeable coach to look them over and make sure the equipment and sizing are appropriate for roller derby. During the informational session, required gear will be discussed along with recommendations on models, brands and reputable skate shops. For your first day of on-skates practice, we require you have your own mouth guard and wrist guards. All other equipment including skates, elbow and knee pads and helmet, are available in our loaner gear for you to use. All loaner gear is available first come first serve. Limited sizes and models are on hand and is not guaranteed to be available. 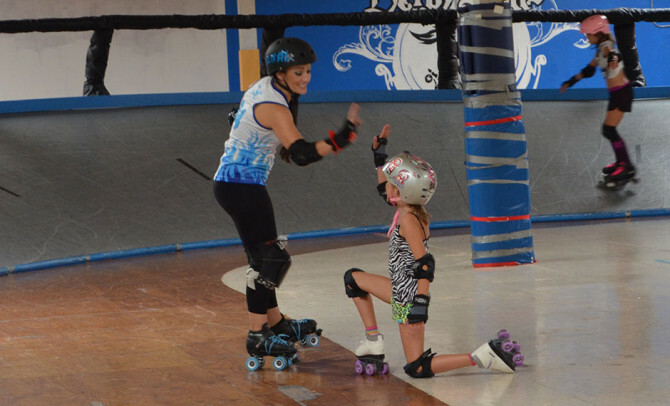 The Dolls do have an in-house pro shop where skates and roller derby gear may be purchased. I can't make it to this orientation, when is the next one? Please check our events page for the next orientation date. They are usually the 2nd Saturday of the month each quarter unless otherwise noted. Make sure to email juniors@sandiegoderbydolls.com if you cannot make it to your orientation and would like to reschedule. I want to watch a game! When's your next one? You can find more information about our upcoming games on our events page. Sign up for our monthly newsletter and you’ll get an email when tickets open up to the public for sale. I've never seen derby in person. What are the rules? You can also see a review of the rules here, and read through our roller derby glossary. Our YouTube channel also has many videos including this one on the basic rules of the game. Our instructed practices for all levels of junior skaters are held Saturday mornings from 9:00 – 10:00 for beginners, 10:00 – 12:00 for intermediate skaters, and 9:00 – 12:00 for team level skaters. All skaters are always welcome to work on their skills individually or in small groups before or after their practice time on whichever track isn’t being utilized or on the half-pipe ramp, as long as they don’t disrupt coached practices. Team level (bouting) juniors also practice on Wednesdays from 5:00 – 7:00 pm. Additionally, Open Skate is held on Fridays from 6:00 – 8:00 pm and Sundays from 3:00 – 5:00 pm and is co-ed and open to all ages and levels. I'm on a tight budget. How much does roller derby cost? Monthly dues are $50.00 per month for Bootcamp Juniors. There is also the initial cost of purchasing your own gear. The Dolls have an in-house pro shop and are happy to discuss great deals on “rookie” packages which include all the required gear to play roller derby.